An introduction to state-of-the-art experimental design approaches to better understand and interpret repeated measurement data in cross-over designs. Includes many practical examples, such as PK/PD studies in the pharmaceutical industry, k-sample and one sample repeated measurement designs for psychological studies, and residual effects of different treatments in controlling conditions such as asthma, blood pressure, and diabetes. Utilizes SAS(R) software to draw necessary inferences. All SAS output and data sets are available via the book's related website. This book is ideal for a broad audience including statisticians in pre-clinical research, researchers in psychology, sociology, politics, marketing, and engineering. DAMARAJU RAGHAVARAO, PhD, was Laura H. Carnell Professor and Chairperson in the Department of Statistics at Temple University. 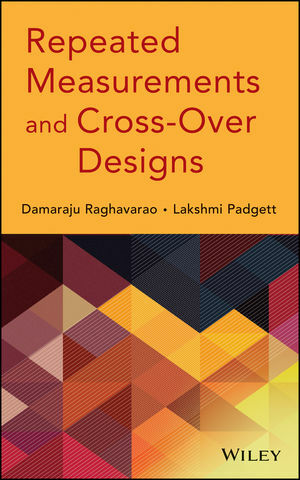 With more than fifty years of research experience in all aspects of experimental design, sampling, and multivariate analysis, Dr. Raghavarao authored eight additional books and over 135 journal articles throughout his career. LAKSHMI PADGETT, PhD, is Senior Manager at Janssen R&D. Dr. Padgett has authored approximately twenty journal articles, and her research interests include phase I, II, and III trials.